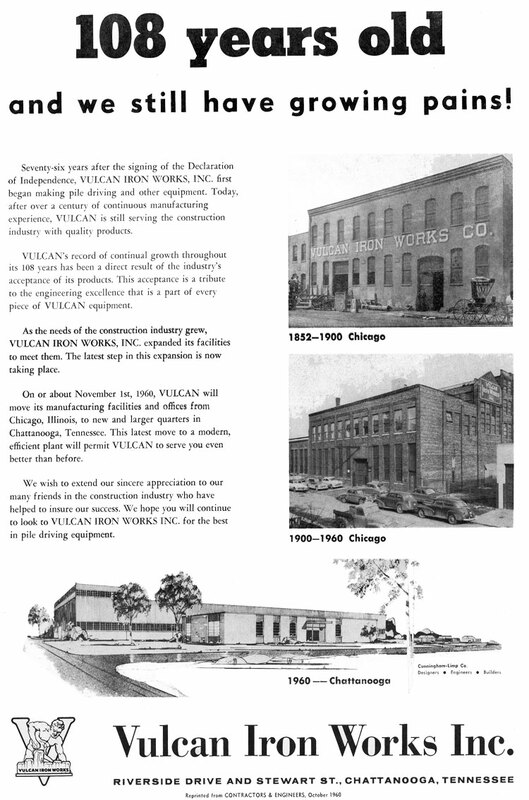 By the late 1950’s it became evident that the Chicago facility was no longer adequate for Vulcan’s expanding business, both in terms of volume and size of equipment. In addition, both the plant, its location and the company’s labour situation built into the company’s financial picture costs which were increasingly difficult to bear. It is understandably difficult to make the decision to move a Company that has been located in one place for more than a century. First, consider that, for all practical purposes this move should have been made many years ago. 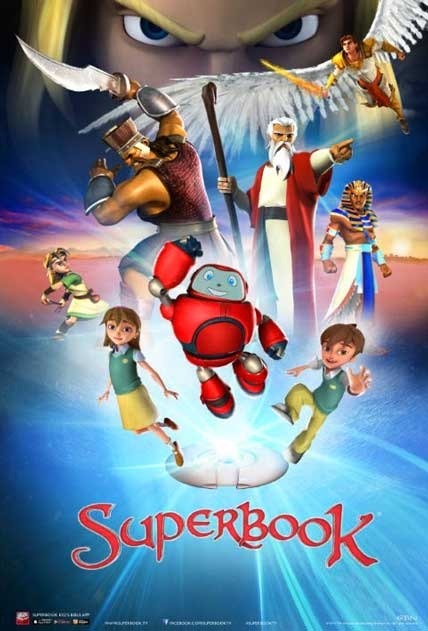 I cannot speculate on the reasons why it was not effected because I was not present, but the mere fact that it was not done does not change the fact that it should have been done. If it is the decision of this Board not to move the Company, I can readily visualise the expenditure of funds in low and medium six figure amounts to make necessary changes in our Plant to bring about changes in our Chicago Plant to yield a more efficient and profitable operation. 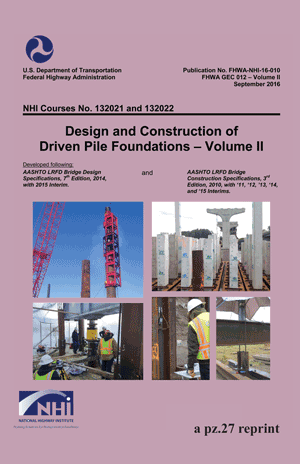 The study in depth of our Chicago operation has yielded some interesting and alarming facts, which, if gone in to and rectified would cost a great deal of money. It would seem to me to be a great error on our part were we to spend large amounts of money on a building, the newest part of which is more than 50 years old. I, personally advocate this move for many reasons; both personal and, more important, business-wise, mainly because it appears to me that in many ways this move may be the catharsis that this old Company needs. 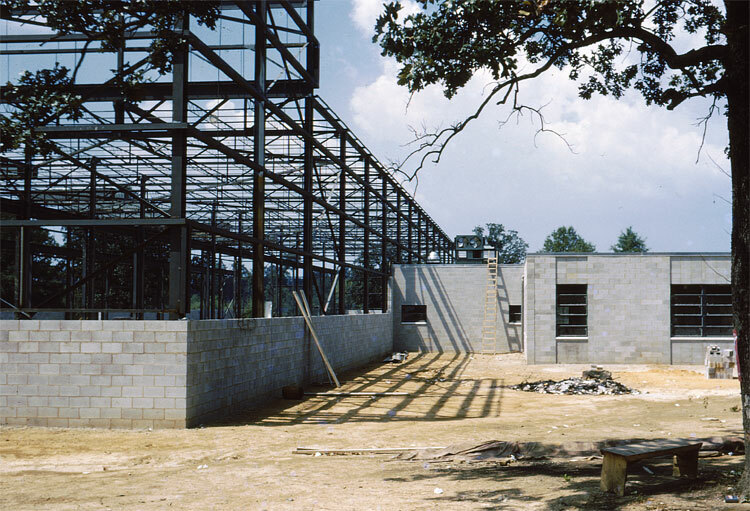 Construction on the plant was started 20 May 1960 and was completed 24 October 1960, on schedule. The operation was moved shortly thereafter. 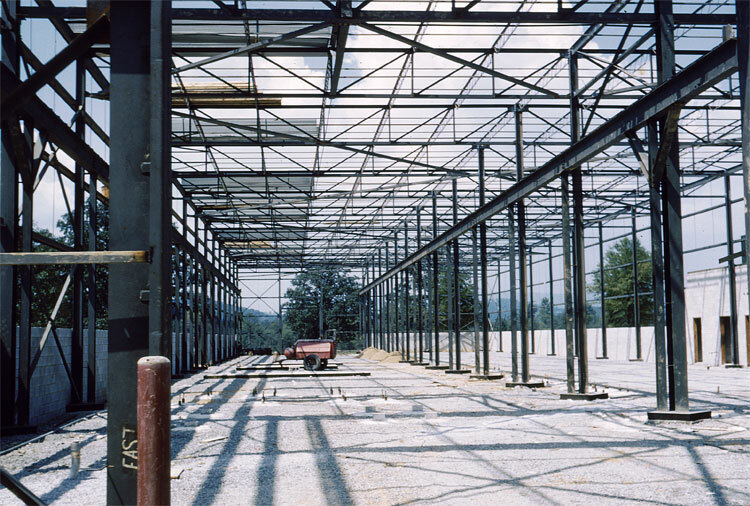 The Chattanooga plant as it looked in November 1968. The high portion on the left was the main assembly area; the offices were at the right. 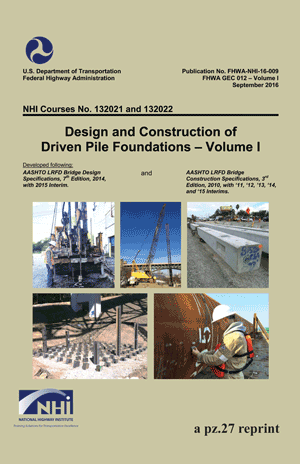 By the end of the 1960’s the requirements for the large offshore hammers had outstripped both the plant’s ability to assemble the units indoors and Ross Meehan’s ability to pour large enough castings, starting a long trend of outsourcing. 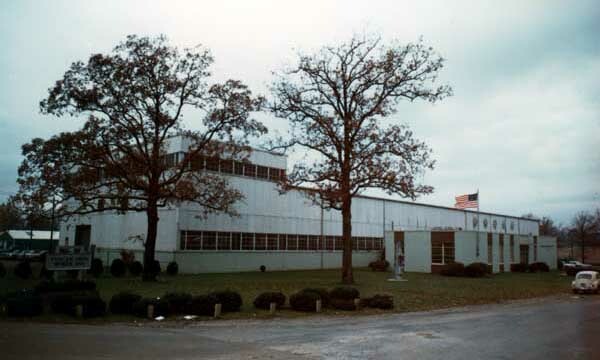 Nevertheless the Chattanooga facility remained a well organised and neat production facility until it was sold to Roadtec in 1999. 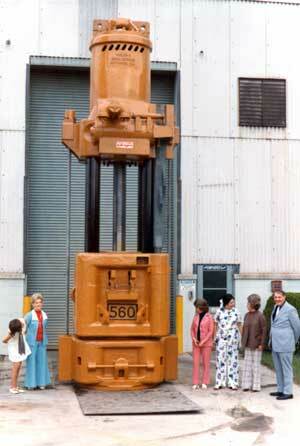 The first Vulcan 560 hammer, at the Chattanooga facility in 1973, with some of the employees. 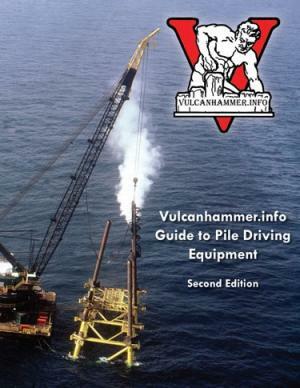 The 560 was Vulcan’s first 5′ stroke hammer; it was immensely successful and become the most important hammer in the Vulcan offshore line, and its introduction was a major step upward for Vulcan. 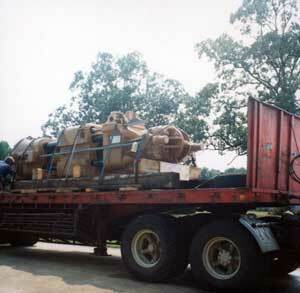 A Vulcan 030 offshore hammer, ready for shipment. This hammer sports what is probably the best ram key retaining system Vulcan used, i.e., the set screws visible under the ram keys. Also visible is the Vari-Cycle out front of the steam chest on the cylinder. 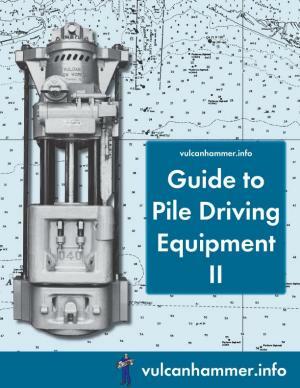 Generally, Vulcan mounted the Vari-Cycle so that the cylinder would sit flat on top of the steam chest, but in the case of these hammers it was placed at an angle. Also note that the ram is blocked in the middle of the columns, between the cylinder and the base. In the late 1970’s Vulcan changed this procedure so that the ram was pushed to touch the base and blocked. Although it moved the centre of gravity of the hammer towards the base, it also enabled the hammer to be set upright without having to block the ram first. 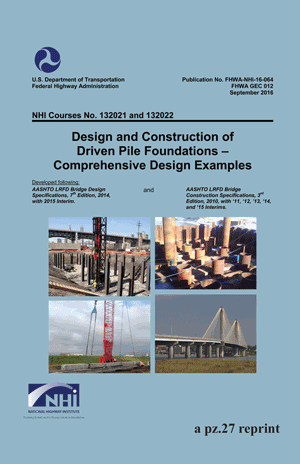 The deed is done: the announcement in the October 1960 issue of Contractors and Engineers. Other reasons the plant was located in Chattanooga were to put the company near a source of skilled labour (albeit one with a penchant to organise trade unions; Vulcan’s bargaining unit was initiated in 1962, about eighteen months after the plant opened) and near a source of both iron and steel castings, mainly the Ross-Meehan foundry. Making the final touches on the 560 hammer. 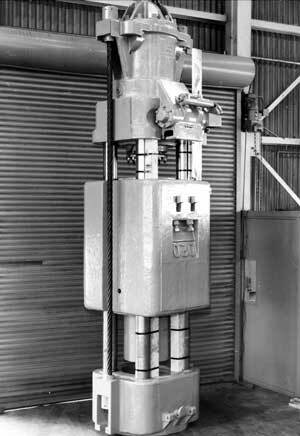 The hammer is held together with cables and these are tensioned with a hydraulic tensioning device, which is being pressurised. Vulcan’s Chattanooga facilty was staffed by a loyal and consistent workforce. In this photo Chairman V.S. 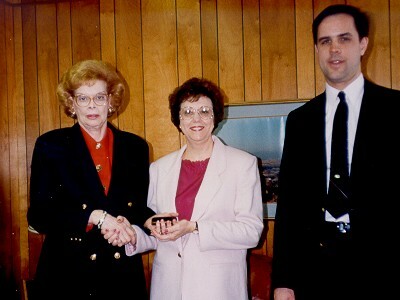 Warrington (left) and Vice Chairman D.C. Warrington (right) present a service award to bookkeeper Linda Grant in the early 1990’s. Linda went on to work for the Tennessee Corporation after they acquired Vulcan in 1996, and for Vulcan Foundation Equipment after they acquired the product line in 2001. Her days at Vulcan only ended when VFE left Chattanooga altogether in 2005. To the left, the assembly area, and the office to the right. 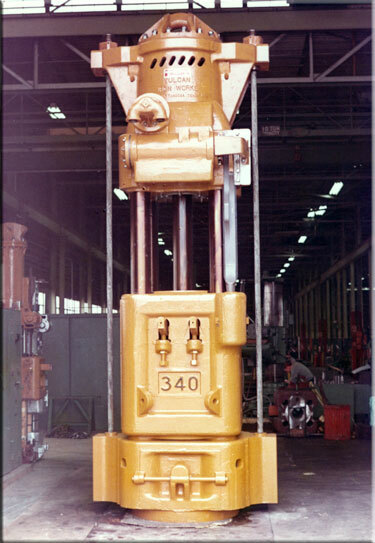 A pedestal driving head, on the floor at the Chattanooga Facility. The Chattanooga plant under construction. Below is the office, with the assembly/machining/warehouse bay behind it. 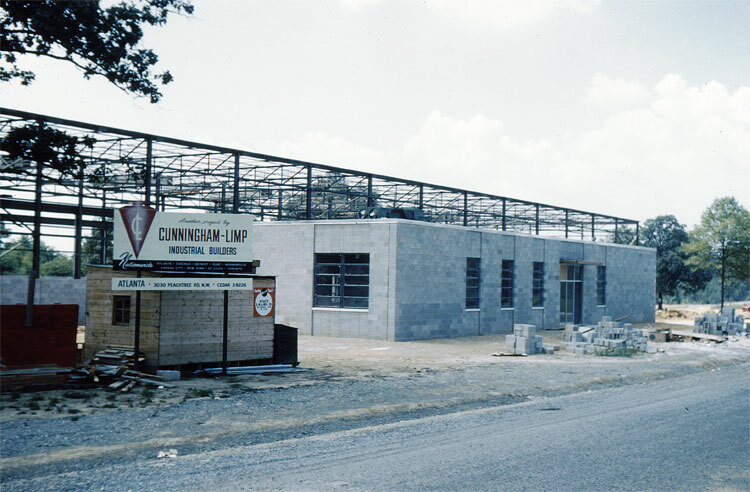 Cunningham-Limp was the designer and contractor; they designed the plant expansion twenty years later. Looking down the machining bay, flanked by the crane rails. 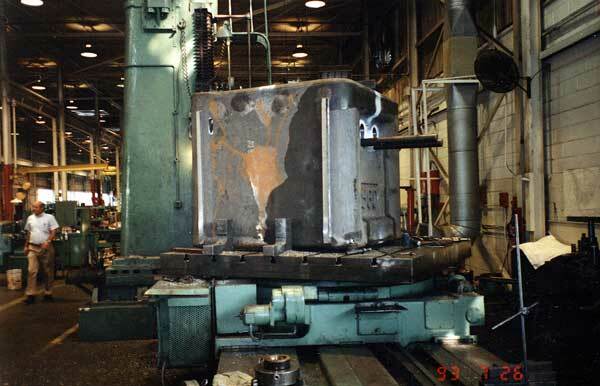 A Vulcan 560 ram being machined by the Giddings and Lewis “floor” horizonal boring mill in 1993 (probably for Hyundai.) 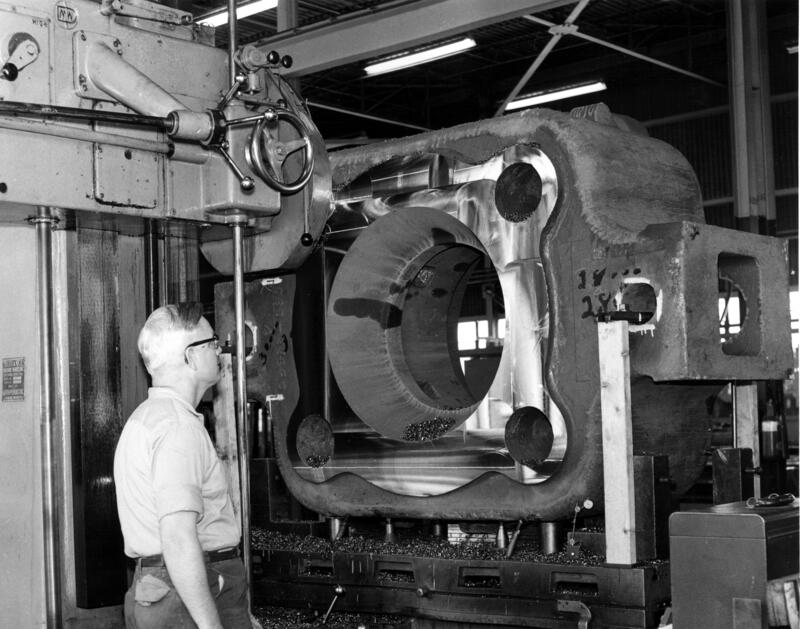 Boring mill capacity was the most important machining capability of the Chattanooga facility, as it was the hardest to procure elsewhere. Strolling down the aisle at the left is John Gourley, Vulcan’s last plant manager for the 2909 Riverside Drive facility. He combined an affable nature with a superb command over manufacturing processes and costs to be the best plant manager Vulcan ever had at the Chattanooga facility. A view down the main aisle of the Chattanooga facility in 1968. 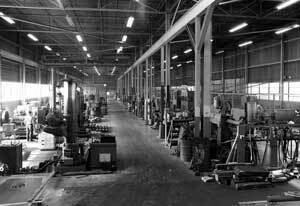 The boring mills and larger lathes were to the left of the aisle; the smaller machines and the stockroom were on the right. The photo is taken from the assembly area; the shipping area is at the far end. 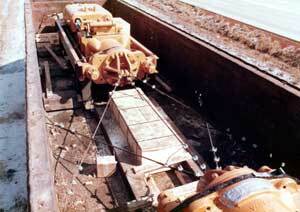 A Vulcan 340, standing in the assembly area, ready for shipment in 1973 to McDermott Offshore in Amelia, Louisiana. It is interesting that the last offshore hammer Vulcan Iron Works produced was a 340 for the Venezuelan organisation PDVSA in 2000. 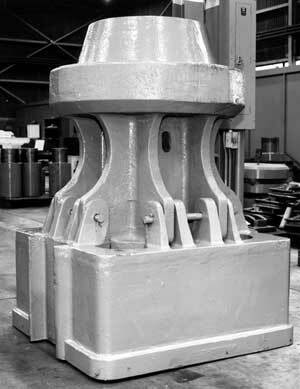 One of Vulcan’s horizontal boring mills machining an offshore hammer base. Vulcan’s boring mill capabilities were key to its ability to manufacture these hammers, as they were scarce, even in a country with the industrial capabilities the U.S. had at the time. 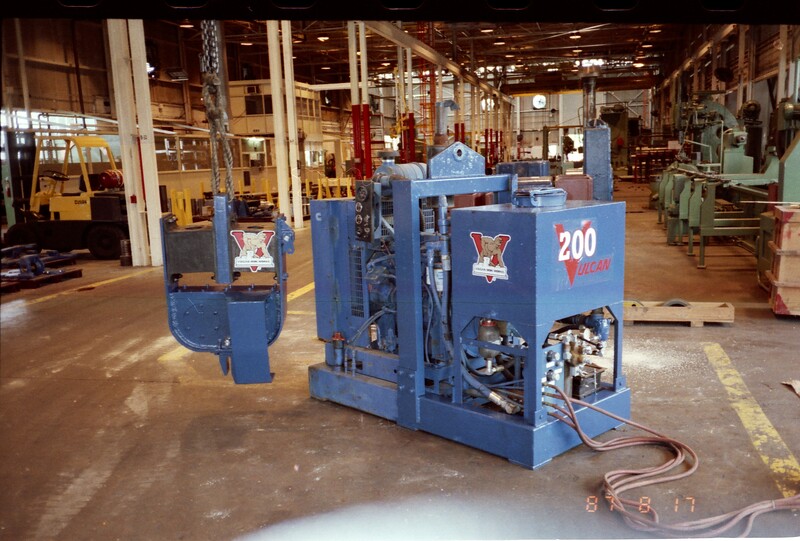 Vulcan’s smallest vibratory hammer, the 200 (later 400) in the shipping department at Vulcan’s Chattanooga facility, August 1987. Behind it is a good view of the original shop.